Musicians’ greatest satisfaction often comes from playing in an ensemble with others of similar abilities. The ability to work with others is an extremely important skill that we develop over many years and experiences. 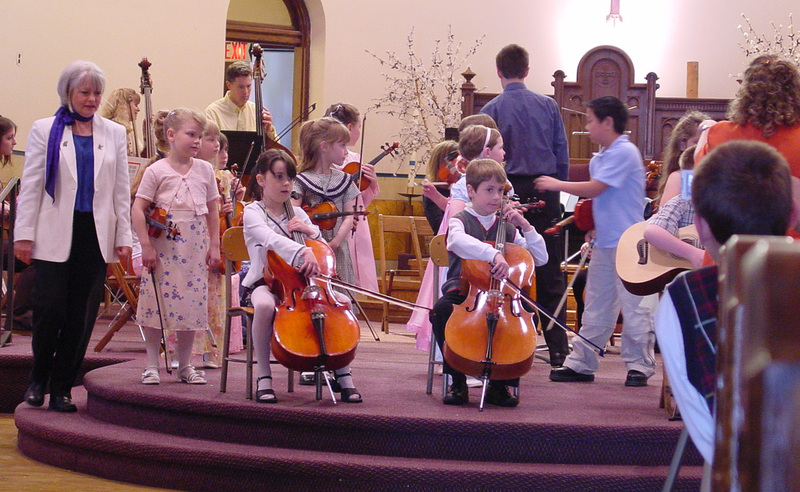 The School for Strings offers youth orchestra for students of various advancements. Our Certificate Program includes participation in the appropriate youth orchestras as decided by our directors. Our directors carefully select, and when needed, arrange, the music for our orchestras to fit the specific abilities of the individual students in each group. That means each student receives music that builds technique, provides just the right amount of challenge and is printed at a readable size. Festivo Orchestra consists of our most advanced players, including many adults, rehearsing for 90 minutes weekly during the academic year. Area choirs and church services often engage Festivo for performances so they learn some of the great cantata and oratorio literature and work with numerous other conductors. Often our advancing students have the opportunity to serve as guest conductors for Festivo. Students often become soloists with the orchestra. These students perform a wide variety of music including string symphonies and other classical literature by great composers from the Baroque to 21st Century, standard jazz tunes and and more popular or movie-themed works. Corelli Strings consists of advanced beginning and intermediate level players of all ages, including adults. Corelli performs in all our Ensemble Concerts and is requested for special performances by organizations who want to see younger, advancing students playing their violins, violas, cellos and double basses. ​Corelli rehearses every week during the school year for 75 minutes. For tuition for our Orchestras click here. ​For a performance by one of our Orchestras click here.